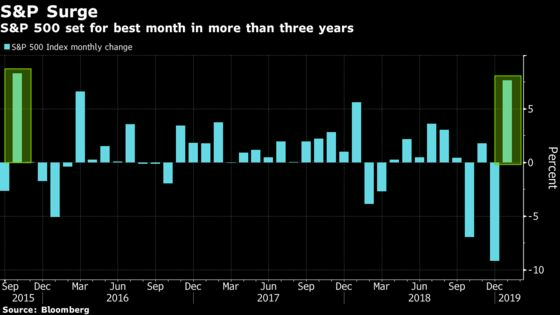 (Bloomberg) -- U.S. stocks rallied to cap their biggest monthly gain in three years as better-than-expected corporate earnings and the Federal Reserve’s dovish turn lifted investor sentiment. Technology shares led advances as the S&P 500 Index closed at an eight-week high. General Electric Co. and Facebook Inc. both surged more than 10 percent after traders cheered their quarterly results. Emerging-market shares advanced while Treasury yields fell a day after signals from the Fed that it will be “patient” on interest-rate moves and flexible on reducing its balance sheet. Elsewhere, the pound was steady as the European Union and U.K. appeared on a collision path over Brexit. The Stoxx Europe 600 Index ended little changed after a positive start, with banks among the biggest drags as energy companies rose following strong results from Royal Dutch Shell. In Asia, equities in Japan and Hong Kong rallied, while Chinese stocks posted a modest advance. The S&P 500 Index rose 0.9 percent, extending the monthly gain to 7.9 percent. The MSCI Emerging Market Index jumped 1.3 percent to a four-month high. The Nikkei-225 Stock Average rose 1.1 percent. The euro slipped 0.3 percent to $1.1444. The British pound was little changed at $1.3114. The Japanese yen strengthened 0.1 percent to 108.91 per dollar. The yield on 10-year Treasuries decreased five basis points to 2.63 percent. Germany’s 10-year yield declined four basis points to 0.15 percent. Britain’s 10-year yield declined four basis points to 1.22 percent. Italy’s 10-year yield fell one basis point to 2.58 percent. West Texas Intermediate crude fell 0.3 percent to $54.02 a barrel. Gold was little changed at $1,319.78 an ounce.